“The pavilion takes advantage of high-quality wood products – which function as a long-term carbon store – in a variety of ways. The pavilion can be transported to the site as ready elements, unloaded, moved again, and re-assembled. 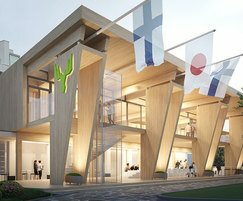 This is in line with Metsä Group’s goal to replace fossil-based products with renewable and recyclable materials,” says Mikko Saavalainen, SVP, Business Development, at Metsä Wood. The Kerto® LVL products to be used in the pavilion’s construction are ecologically sustainable and efficient in terms of their material. The production process of the materials and elements generates very little waste. The elements will be pre-assembled at the plant of Metsä Wood’s partner company and, thanks to this, assembly on site will be rapid. The architectural design of the Metsä pavilion will be carried out by Helin & Co Architects. The design is based on the Kerto® LVL-based elements freely available to everybody in Metsä Wood’s Open Source Wood service.